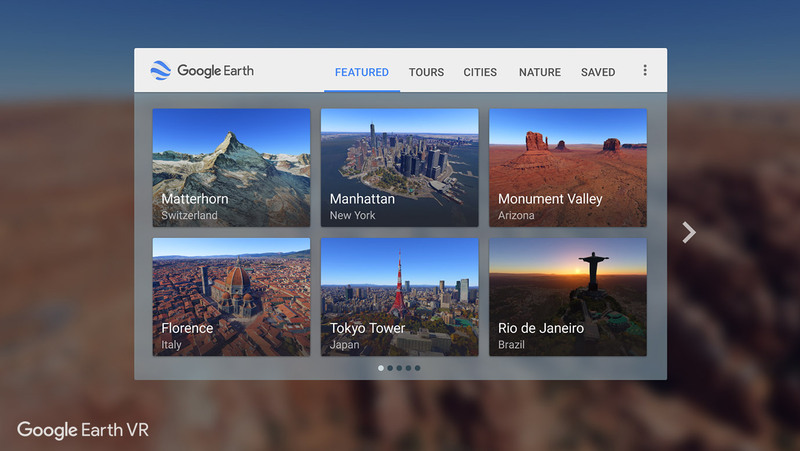 Today Google launches Earth VR for the HTC Vive for free, giving us a whole new perspective on the world. I remember, back in 2001, how amazed I was to see Google Earth for the first time. 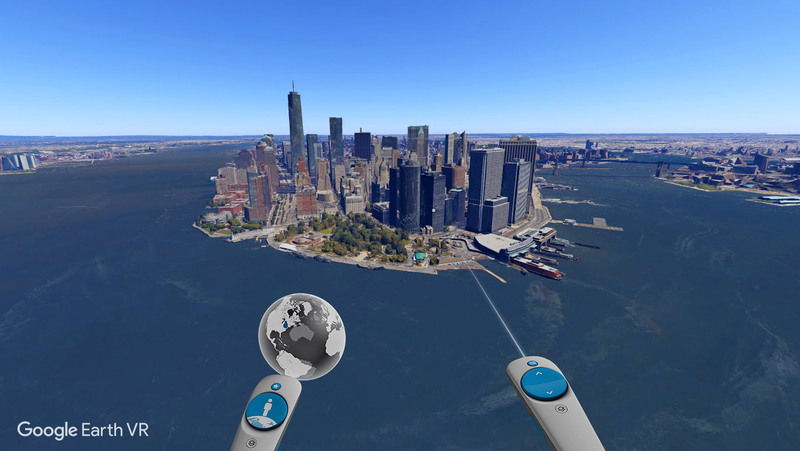 I remember huddling around the computer monitor with friends shouting “go to New York City!” “Go to Hawaii!” “Go to the Grand Canyon!”, and with a line of text and a tap on the return key, we were there, as the digital globe spun and zoomed in smoothly to give us a previously unseen view of these exotic locales. Google Earth made the world tangible in a way we’d never known it. 15 years later, in Google’s San Francisco office, I felt that same magic. Except this time, I could not only fly from one place to another for a bird’s-eye view, I could zoom down and plant my feet on the ground with the entire Earth encompassing my view. I don’t use the word “breathtaking” in headlines often. But when you find yourself towering over a detailed recreation of San Francisco, or standing eye-level with the top of the Eiffel Tower, or watching the Sun set and the Milky Way rise over the plateaus of Monument Valley, it’s an easy choice. Launching today on the HTC Vive for free, Google Earth VR lets you touch and explore an incredible dataset—high-res satellite imagery, aerial photography, and photogrammetric recreations of major cities—all seamlessly integrated into a single model of our planet. Donning the HTC Vive, you’ll find yourself first looking at a small version of the planet set against a black backdrop of space. 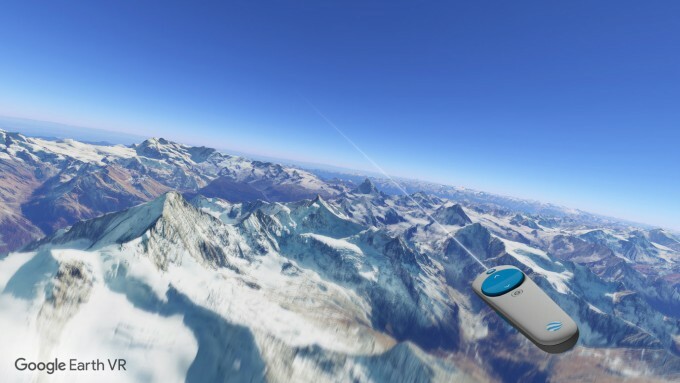 Using the Vive’s controllers, you can hold the top half of the right trackpad to zoom in toward the planet. As you zoom in you’ll being to see labels of countries, and even closer, states, cities, and towns. At this point though, you’re still flying face-first toward the ground; as you get closer you’ll want to tap the left trackpad which will flip your perspective 90 degrees so that your horizon becomes that of the planet’s surface. Now it feels like you’re walking on the planet like a giant, and you can continue to zoom down to your destination. You might suspect that flying all the way from down from space and then shifting your horizon 90 degrees would get dizzying in VR, but Earth VR employs a smart locomotion method (which doesn’t rely on teleporting). You’ll fly in whatever direction you point your controller and as you do you’ll see that the peripheral field of view shrinks around your center of vision, revealing a static grid around you. When you stop again, the view will expand to fill the scene as before. It’s a solution that works impressively well, even as you grab the earth below you and drag it along to move from one town to the next. It also keeps you more immersed in the experience by actually letting you traverse from place to place, rather than just appearing there. And, thankfully for those not prone to any VR motion sickness, you can turn off the shrinking view entirely, letting you fly about with the fully expanded scene around you. Once you do get down to ground level, you’ll find that most anywhere on the planet has high-resolution satellite imagery and elevation data. If you visit some of the world’s biggest cities, you’ll find them fully modeled in 3D. When I first tried the experience at Google’s offices in San Francisco, I knew I had to see the city itself from within Earth VR. So I zoomed down until I was the size of a small skyscraper and walked around the 3D recreation like I was a giant. I could lean down to peer at the streets between buildings, or stand next to the cities skyscrapers. I could see the Giant’s stadium and, off in the distance, the Golden Gate Bridge. It’s a really spectacular way to experience something you know in an entirely new way. And it isn’t just cities; some areas of Earth VR, like Yosemite National Park, are modeled down to the individual tree, making the view all the more rich when you grab the virtual Sun and spin it down on the horizon to bathe the park in a beautiful sunset. Dial the sun a little bit further down and you’ll see the Moon and stars rise over Half Dome. For the time being, there’s no search function in Earth VR, so your journey is mostly manual exploration. Though once you find somewhere you like, you can bookmark it by taking a virtual photo which will be stored in your Saved menu and can be returned to at any time. There’s also several pre-installed guided tours which take you to scenic locations and even give an ambient soundtrack to make things that much more serene. One day I imagine such guided tours could have voice-overs that teach you something about each place you visit. The company has done an impressive job of bringing Google Earth to VR. It feels robust. 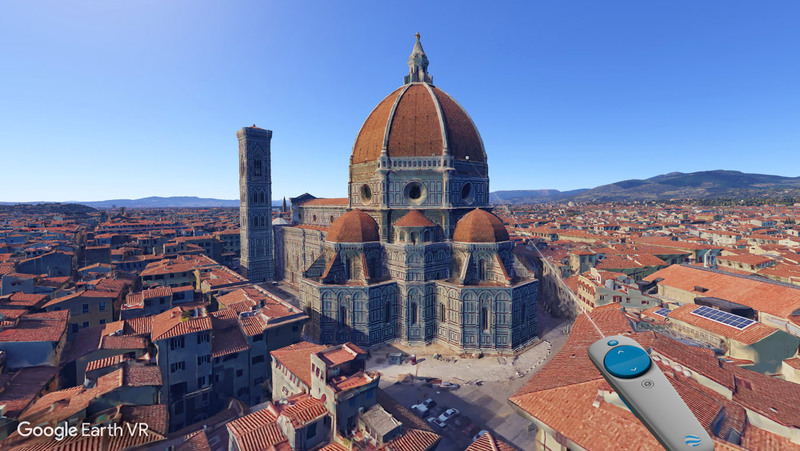 The development team sells me that the app is built so that it will continually benefit from improvements in the Google Earth dataset over time, and that, “Earth VR is a product, not a demo,” one that they plan to continue adding to after launch. I hope that one of the top features on their post-launch list is social functionality. Google Earth VR is breathtaking, but when you’re in the headset alone you can sometimes feel like you’re the only one on the planet. 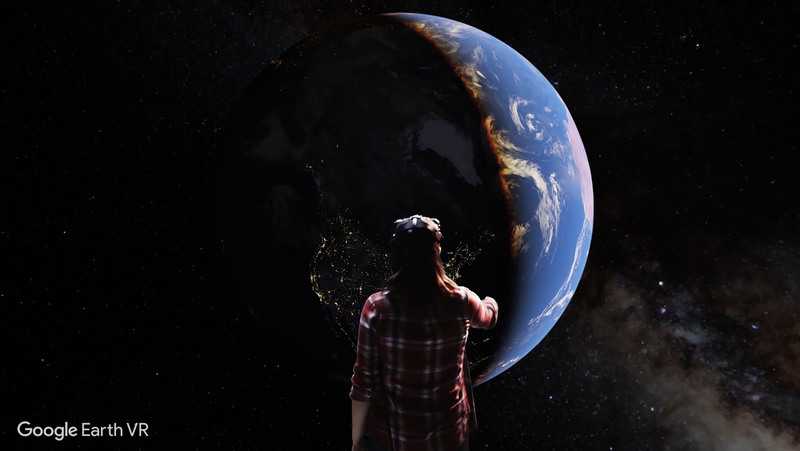 The post Google Launches Earth VR on HTC Vive, A Breathtaking New Way to Know Our Planet appeared first on Road to VR.